The 2018 Nissan Armada is loaded with maximum horsepower that gives it impressive towing capabilities along with an advanced all-wheel drive system. All of these options together make the vehicle a very versatile piece of equipment for any new car owner. The engine is a powerful 5.6 direct injection gasoline V8 that is rated at 390 horsepower and provides 394 lbs-ft of torque. The towing capacity is the best in its class at 8500 pounds. Dual overhead cams, 32 valves and WEL valve control provide an enhanced throttle response while maintaining good fuel economy. This gives the vehicle plenty of power on the roadways. 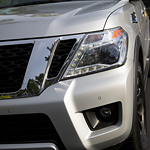 The Nissan Armada possesses a 7-speed automatic transmission with adaptive controls and downshifting. The vehicle automatically adjusts its traction in different situations. This gives it the ability to handle rainy services and off-road conditions. The driver feels in control during all seasons of weather. An expert at Gregoris Nissan is waiting to assist anyone in Valley Stream who is ready to test drive a new Nissan Armada today.